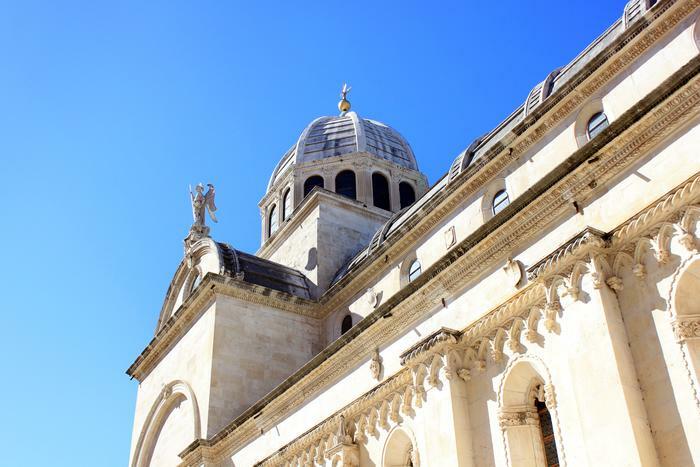 The story of Dalmatia and UNESCO begins with the Saint James Cathedral in Šibenik. This fascinating edifice was constructed entirely of stone, and its facade is adorned by a wreath of seventy-four stone heads which represent the sculptor's contemporaries. UNESCO has also included the old historical core of Split in their list of global cultural heritage. Inside the seventeen-hundred-year-old Diocletian's palace, what was once the emperor's mausoleum was long ago converted into a cathedral of Saint Dominus. The old town of Trogir continues the string of pearls on the UNESCO list, where a unique street plan features the cathedral of Saint Lawrence with its gorgeous medieval entrance - the Portal of Radovan. Another medieval town which has bedazzled UNESCO is in the very south of Dalmatia. The old city of Dubrovnik, replete with baroque churches and palaces, is surrounded by towers which are connected by a full two kilometers of city walls. On the island of Hvar, where Dalmatia has secreted her most fertile fields, UNESCO has protected a unique witness to a land distribution system set up in antiquity. The vineyards and olive groves of Stari Grad plain have remained unchanged since they were colonized by the ancient Greeks. Dalmatia's most delicate ornament, the handmade lace, is part of the folklore wealth of Pag island which was recently recognized by UNESCO. Traditional lacemaking is cherished on Hvar as well, where agave threads are used for this purpose. Hvar is well-known for another example of protected heritage - the springtime (Lenten) religious custom of following the Cross, a tradition kept up by the faithful of Hvar for five centuries already. The traditional procession covers the distance of as much as 25 kilometers, bringing together six towns of Hvar island. Dalmatia has for centuries maintained a knight competition known as the Sinjska Alka, or the Ring of Sinj. The knights of Sinj town, galloping down an alley in an attempt to aim their lances at a metal ring (alka) hanging on a rope, have conquered UNESCO as well. Yet another example of historical wealth transmitted through the generations of Dalmatians - ojkanje singing - has also recently found its way into UNESCO protection. An easily recognizable voice-shaking technique perfected in the Dalmatian hinterland "produces" a song that last as long as the singers' breath. A cultural event taking place in Dubrovnik since the tenth century - the Feast of Saint Blaise - marks the spiritual connection between the city and its patron saint. The colorful culture of southern Dalmatia as exibited at the Feast has delighted UNESCO.